After the voting station opened late, with rumours circulating that this was an attempt at sabotaging an EFF hotspot, election day in Marikana nonetheless passed reasonably uneventfully. THAPELO LEKGOWA was there to take pictures. A mother carries her small child at the voting station queue in Nkanini Bleskop, Rustenburg, North West. “We have a good story to tell.” Kids play in a dusty street while their parents have gone to vote. Nkanini Informal Settlement, Bleskop, Rustenburg, North West. “We have a good story to tell, too.” Another dusty street in Nkanini Informal Settlement with no running water and electricity. Bleskop, Rustenburg, North West. 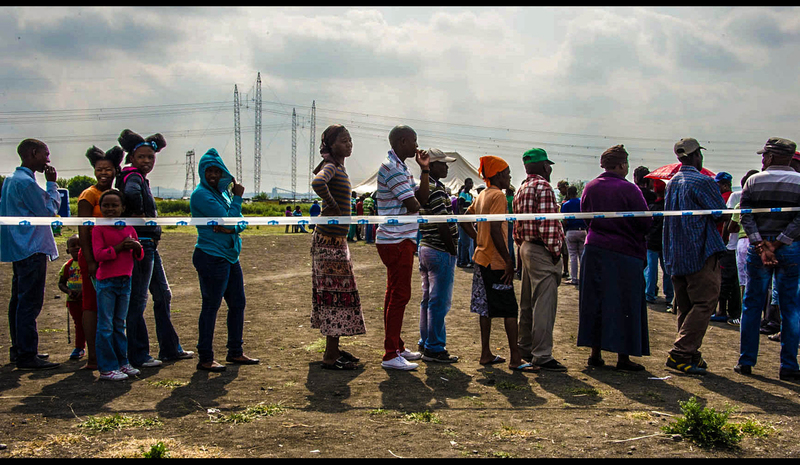 A queue at the Nkanini voting station, Bleskop, Rustenburg, North West. ‘We voted and expressed our power.’ Boitekong Extension 13, Rustenburg, North West. MAIN PHOTO: Young and old all turned out to vote. Boitekong Extension 13, Rustenburg, North West.